My sister, Kari, turned 30 back in June and she wanted to take a trip somewhere to celebrate. We ended up taking that trip the last weekend of September and staying in Louisville, Kentucky. 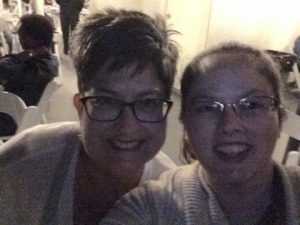 For us, that’s only about two hours away, but it ended up being a really great girl’s weekend since it was my sister, our mom and me. 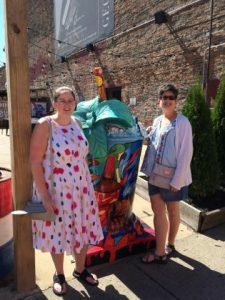 Today, I thought I’d share some of what we did to entice you to make your own trip there someday – and preferably sometime that is not Derby season where it’s bound to be crazy busy. 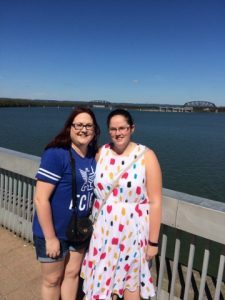 Since this was my sister’s birthday getaway, she decided on everything we would do, which included staying at the Galt House Hotel. This is seriously one of the best hotels I’ve been in. It takes up two towers and includes a spa, various restaurants, and an even a common area of sort with a lot of places to relax, watch TV, get a drink, and it even includes a convenience store of sorts called Thelma’s Deli that is open 24 hours and sells breakfast, smoothies, pizza, drinks, candy, and more. When we had various down time, we’d just hang out here and talk (or in my case, read) and it was a nice place to grab some water or a snack. This hotel allowed us to do a couple different activities that weekend without going very far, including the spa (in the hotel) and the boat ride (right next to the hotel) so it was definitely a handy place to stay. We arrived Friday night, spent all day Saturday in Louisville, and left late Sunday morning. We had breakfast at Cafe Magnolia in the hotel Saturday morning. We all opted for the buffet, but it actually wasn’t as big as we realized, so if I ever went back, I’d probably just purchase a single breakfast item from the menu. The food was really good though! No matter where we went for my sister’s birthday, she had a spa day of some sorts in mind. Therefore, the Galt House Hotel was a perfect fit because they have their own salon and spa called Xhale. I’d never had an official massage before, so I knew I wanted to try one, and my sister loves them, so she got one too. Mine was a Swedish massage and it was only 30 minutes, because I wasn’t sure how I’d feel about it. I ended up loving it though – it’s so relaxing. The room had nice music and a diffuser for oils. Very nice! My sister got the hour long massage with hot stones, and she loved hers too. My mom, on the other hand, opted for a hand massage and manicure. We all had a really good experience. Everyone was friendly and made us feel welcome. While waiting for my sister, my mom were even given cucumber infused water and some cookies. If you stay in the hotel, I would recommend checking out the salon/spa, and I’ll definitely get another massage in the future now that I know I like them! For lunch on Saturday, we walked to The Old Spaghetti Factory which wasn’t too far from our hotel. All of our meals was the three-course meal, so we got bread, a salad, and their spumoni ice cream for dessert. Prices are a bit higher, but nothing too outrageous for a nicer meal. I got the Famous Baked Lasagna for $13.75 and that included everything I mentioned above. My food was really good and I know my mom and sister both really enjoyed their meal too. I do recommend going sometime if there is a restaurant near you. I know we have one not too far from where we live, so I’ll go back for sure! There is even a section in the restaurant looks like an old-fashioned train and there are tables where you can eat on the train. I think that would be fun to do sometime in the future! We didn’t think to ask when we were in Louisville until after we’d been seated. Just hanging out on Whiskey Row! One of the famous boats in Kentucky is the Belle of Louisville, which you can board for sightseeing and/or meals. The Saturday night we were in Louisville, however, the boat wasn’t taking reservations. 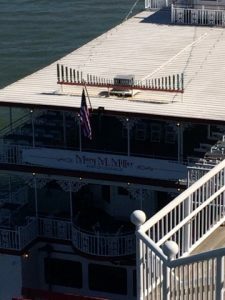 However, they did have the Mary M. Miller steamboat available for dinner! I live near Cincinnati, and we have boats that do the same type of tours/meals, so my sister knew this would be something we’d all enjoy, and enjoy it we did! The boats actually right outside our hotel, so all we had to do was walk down and wait for them to let us on board. If you wanted, you could get your picture taken before getting on board, so we did, and since we liked the photo, my mom bought a copy for herself and my sister. Once on board, we were directed to our table – which ended up being near the front of the boat, so that was nice. We grabbed some drinks and hung out while everyone else arrived and the boat finally took off. My mom and I on the top of the boat! Once we were on our way, it was time for dinner. Not everyone on board had paid for dinner, so they directed the tables to go one by one. You never know what type of food you’ll get on a dinner cruise – what you’ll like, etc. – but all three of us loved it. There was even some left for people to go up and get seconds, which we definitely did! Of course, one of my favorites was the dessert, which was a seven layer bar of sorts. So good! Once were finished eating, we made our way to the very top of the boat (there are three levels) so that we were now outside and able to see the views. We had turned around by this point and were able to see downtown Louisville, which was beautiful. 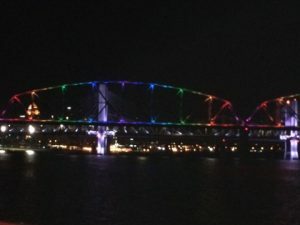 One of the bridges actually lit up and did various colors/patterns so that was fun to see – and try and capture in a photo. I got a good one of the rainbow colors, which were lit up as we were passing under. Overall, the boat ride was about two hours. It was a lot of fun, and quite relaxing! They played music the whole time- and the DJ of sorts also told little anecdotes and whatnot throughout which was fun. Once we docked, we made our way back up to the hotel and hung out in the common area I mentioned earlier. Despite having eaten already, we knew we were going to get a pizza, having realized they served it at Thelma’s Deli. None of us really eat much that late at night, but since it was a girl’s weekend, we decided to have fun. After hanging out for awhile, we finally placed our order and then chowed down. It was very good pizza, by the way – so I would recommend for a late-night bite! The Galt House Hotel is right next to the KFC Yum! center so if you visit Louisville for a concert, this might be a fun way to unwind after the show. I know it’s something I’d do! All in all, this was such a fun weekend. I’d been to Louisville before but never actually stayed overnight in the city. It was a fun experience and we realized it made a nice girl’s trip away since it wasn’t too far but still unique enough that we could do things we wouldn’t normally at home! I’d definitely recommend checking out Louisville, Kentucky if you ever get the chance. Have you ever been to Louisville, or anywhere else in Kentucky? Would you like to visit now? You’re so welcome! I hope you can find the time and a good place for a girl’s trip! I love them. This sounds AWESOME! Now I want spaghetti! And spa treatment! I haven’t had a girl’s weekend in foreverrrrr. Funny how I used to make time for them every few months in college, but now I can’t seem to do so. I’m glad you had a great time! 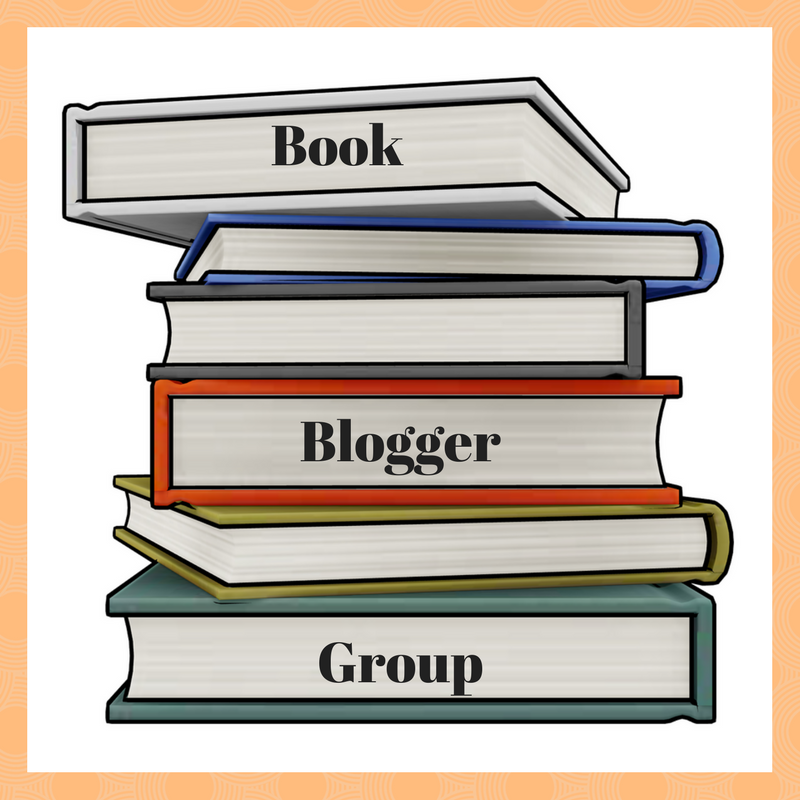 Thanks for sharing about it! It can definitely take time to plan, but it’s SO worth it. 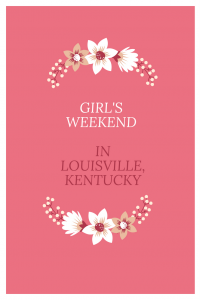 I hope you find time for a girl’s weekend soon. Sounds like a fun girl’s weekend. I have n=only been to Louisville for work so have not been able to explore the city. I love getting massages. I love treating myself after races. What a fun trip!! I’m having a girls weekend, this weekend coming up. Cannot wait!! Nothing better than a girls weekend! I need one stat! What a fun weekend! I’ve flown into Louisville, Kentucky, but never gone to visit! I love hotels that have spas in them! We have a couple of Spaghetti Factories here in STL and I love going there. WE haven’t gone in awhile and need to soon! Oh my goodness, what a trip. How lucky is your sister. This sounds so fun! It’s always great to get a girls night or weekend away. The hotel and Spaghetti Factory sound amazing. And spa days are definitely a must 🙂 glad you had a great time! That’s so sweet and I love your dress Lauren! Girls weekends are the best! It sounds like you had a really great time! We have a Spaghetti Factory here too, I bet it’s the same chain. They have amazing food! What a fun getaway! My mom, my two sister and me meet up once a month for a girls-only breakfast but it’s been a long time since we’ve done a getaway. Love your sundress! So pretty. The spa sounds heavenly – I love massages! Glad you had such a great trip! That’s awesome you guys do a monthly breakfast! I hope you can find time to do a little getaway soon. Awww this sounds like such a fun getaway!! I keep meaning to take my mom for a little vaca; thanks for sharing…I may have to ask her when she gets back from Europe! Also love a good spa and so glad you enjoyed your first massage 🙂 soooo relaxing, right!? Yes, I could have fallen asleep during that massage. And you should totally go on a vacay with your mom! I hope it works out. I’ve only been through Louisville, haven’t spent any time there, but the Galt hotel sounds nice! Sounds like you had a great time! The river boat sounds really fun. And the Old Spaghetti Factory doesn’t sound too bad either. Glad you had an awesome getaway! I’m sure you felt super relaxed afterwards. It’s been a long time since I’ve been to Louisville, but it’s such a great city! What a fun trip for the two of you! Sounds like a fun trip! I have never been to Kentucky but thanks to following some bloggers who live in Louisville I think it would be fun to visit! I’ve never been there before, and this is so inspiring! Thanks for sharing your ideas. What a fabulous time to spend together and make memories, Lauren!! Oh my gosh, What fun!! I’ve never been… Great memories. Thank you for sharing about our home town. We moved away many years ago but still have relatives there. When we go back we act like tourists. So fun! Girls’ weekends are the best. I’ve never been to Louisville before but you’ve got me curious about it now. Glad you had a great time. Wow! What a wonderful time together! 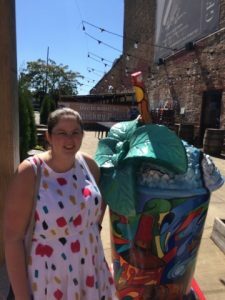 Thank you for sharing about your weekend as well as offering some great tips for a weekend in Louisville. My family is originally from Kentucky so the bluegrass state has a special place in my heart. I need to get back to Louisville for a weekend! Thanks so much for commenting, Robin! That’s cool that your family is originally from Kentucky – I hope you get to visit Louisville again soon! It was such a fun trip. I’ve never been there before. But it sure looks like you girls had a blast! Thanks, Shannon. I’m glad Kentucky sent you your pillow back! That IS kind of them. 🙂 I was a bit nervous about the massage, but it was nice. That sounds like such a fun trip! (Now I want spaghetti for dinner, haha. 😛 ) I’ve been to Lexington, but never to Louisville!